There are many attributes that are assigned to people who wear a badge to do their job. Trustworthiness, leadership, respect of others, having a great service mentality, sense of humility, and being a mentor to those around you. These are some of the qualities that could easily describe Jacksonville Middle School Resource Officer, Dave Turner. In his second school year at JMS, Officer Turner enjoys going to work each day knowing that he can be a positive influence in the lives of the young people. As a Resource Officer, Turner works as a liaison between the Jacksonville Police Department and the Jacksonville Middle School, providing a safe and secure environment for the students and staff. Having worked in law enforcement for 27 years, he has had many opportunities to work with the school system. 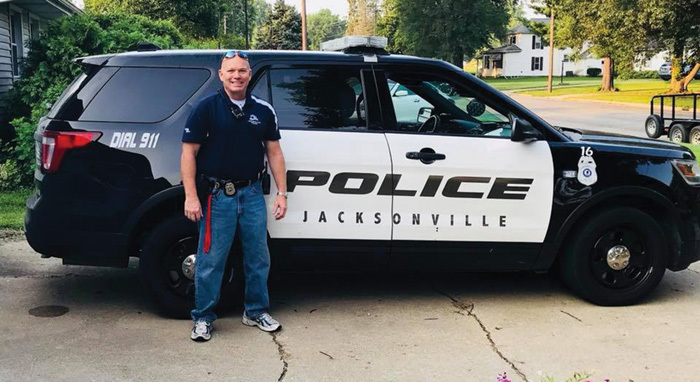 Through the Jacksonville Police Department, he has worked with the Adopt-A-School program which focuses on interaction with the students throughout the Jacksonville School District. He has also given numerous presentations from personal safety to safety procedures including fire, tornado and intruder drills. For the last several years Turner has coordinated with the Jacksonville Police Department’s Teen Citizen’s Police Academy, giving him the opportunity to work with numerous students throughout the area. Prior to serving as a Resource Officer, in his 27 years in law enforcement Turner has served as a Correctional Officer at the Sangamon County Jail; as a Sheriff’s Deputy with the Morgan County Sheriff’s office; and finally, a Patrolman with JPD before taking the position of School Resource Officer. Turner is a Jacksonville native and lives here with his wife Amber and their three children, Jordan, Brittany and Chesney. When he is not on the job, he enjoys being outdoors, spending time with his family and watching their youngest daughter play sports. In addition to serving as a Resource Officer for JMS, Turner is also a real estate broker with The Real Estate Group of Jacksonville and has done that now for two years. “I feel very fortunate to be able to pursue two careers that I love” concluded Turner.